Great its finally first impressions excellent. I have a problem with printing a booklet. Create 4 a5 pages, and number, then print as booklet, - the icon shows the right orientation of pages, but no matter what choice I make in double sided it always flips on the long edge. Have been back to PagePlus9 and tried there works as expected autoduplex flip on short side. I believe I had a problem like this s few versions back... The workaround then was create a PDF and print from that. falling star - Thanks, yes I can do that but really wanted to 'print out of the box'. Booklet printing was just the start, I need also to do 'N up' printing as a publisher of books, and it is the same with that as well. Hoping this is just a minor glitch in the duplex flip on short side routine which can soon be fixed, that is if I'm not missing something crucial. The same Problem here! Printing Booklet on a Toshiba eStudio 4555. There it gives the possibility to print booklet. So I setup a Dokument within Publisher A4. Then I choose the right settings, as I always do with other Microsoft or Adobe Products. But AP turn the A4 Portrait in a A3 Portrait and then it makes a booklet. So the A3 pages are stapled togethere in den middle of the A3. But all ist 90 Degree turned. I can't print a booklet direct from Affinity Publisher; instead of paginating the booklet as A5 pages on folded A4, it centres a single A5 page on each A4 sheet. I've tried a few of the printer's settings but I feel that shouldn't be necessary anyway as in Page Plus the only thing that I needed to do on the printer itself was to select 2-sided printing and long- or short-edge binding (it's an HP LaserJet P2055dn monochrome laser but obviously the same thing would apply to my OKI colour laser if I tried that). I'm aware that I can export the document as a PDF but printing PDFs from an iMac with Adobe Acrobat or with the Mac's Preview PDF viewer is a very slow process and can, in the case of Acrobat, result in misplaced pages. I suspect that it's one of these Mac things and that there is no solution. My theory is that Acrobat and probably Preview too convert each character in the text into an individual vector image but that it uses a painfully slow process to complete this unasked for task. If I could print direct from Affinity Publisher I wouldn't need to delve into the mysteries of Mac and Acrobat. 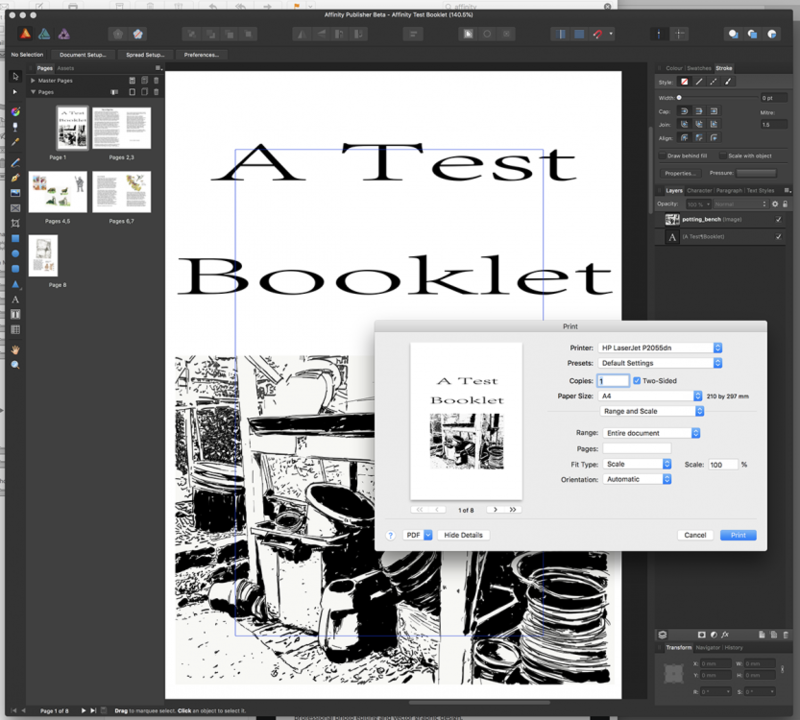 My request to the development team is please could you find a way of allowing me to print a booklet directly from Affinity Publisher that is as fast and efficient as Page Plus was on my old and far less powerful PC? Edit: I’ve just noticed that the options in your screenshot look different from what I see here. I don’t know whether the ‘PDF’ option (in the box to the left of the ‘Hide Details’ button) has any bearing on this. Alfred - we've all tried various settings, the question is can you create a booklet from 4 A5 pages? If so what settings have you used please. Alfred - thank you. 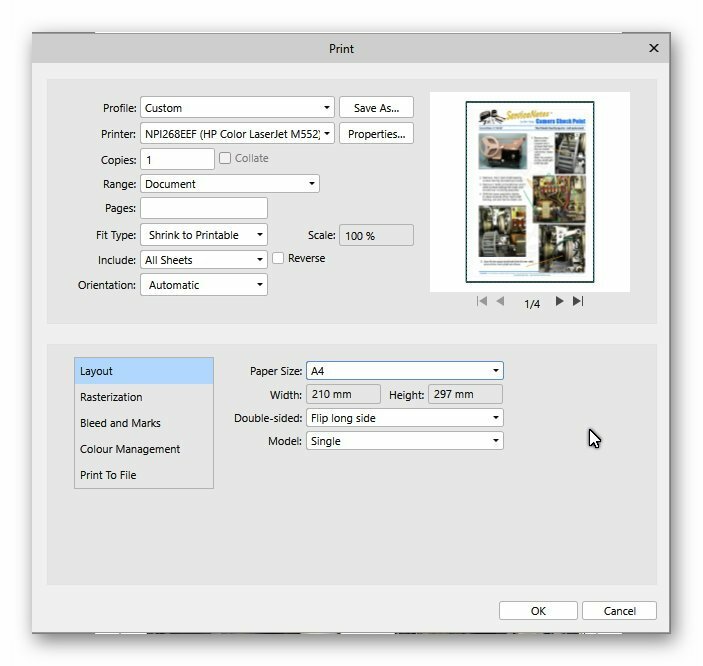 I'll give the PDF option a try as I've yet to do that from an Affinity Publisher beta document. 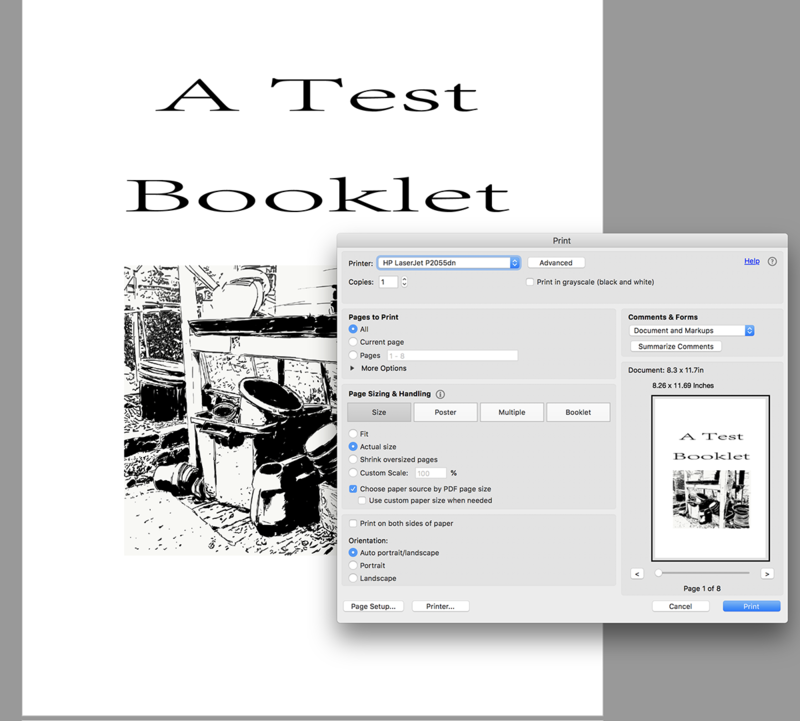 I'll see how that turns out with my little Test Booklet; I suspect that it's going to be slow to print, because I'll still have to go through Preview or Acrobat Pro, but it's worth having a go with my back to basics 8-page booklet. I've attached a screenshot of the print dialog for an eight-page booklet, showing the first (8-1) spread. The other three spreads are, as you would expect, 2-7, 6-3 and 4-5. Edit: From re-reading your OP, you seem to be having problems with duplex printing. I don't have a duplex printer, so I'm afraid I can't help with that side of things. Sorry but to print a booklet does not work, neither to a pdf nor directly to the printer mentioned above. Love the beta! am recreating some Pageplus A4 landscape booklets in A.P. At present it won't print correctly from AP. Using Epson XP-610 I am able to work round. In AP using Scale: 141%. Does this work for other printers? I am now printing 6 copies of a single page with print options set to single-sided and model = single. Each copy is printed as double sided with a blank 2nd page. This obviously takes twice as long and can't be right. I have a Canon MG5750. I've tried exporting as a PDF to print an A5 booklet but, as with printing direct from AP, the A5 artwork gets inserted into the middle of an A4 page. 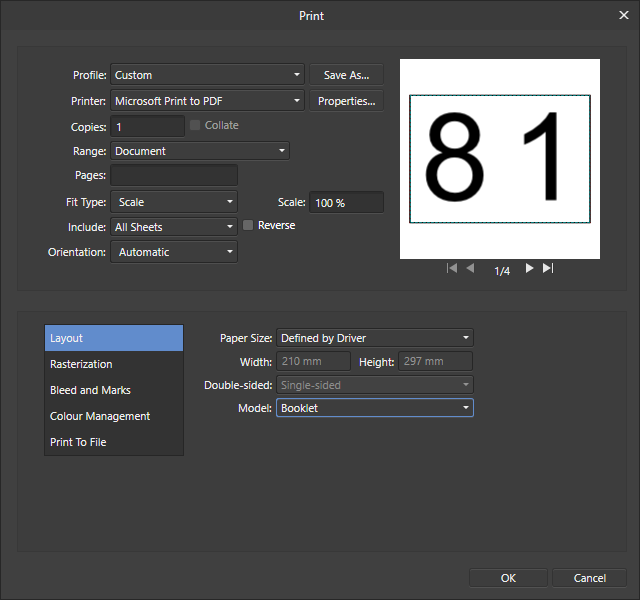 I've taken a couple of screen shots to show the page size settings and the PDF. The shot showing the Spread Setup dialogue shows the page as I intended it with the artwork coming almost to the edge of the A5 page. I was able to print a 4-page booklet (on one A4 sheet), but only by setting the printer drive to booklet and the Affinity to single page. If Affinity is set to booklet and printer driver to normal A4 then a booklet will also print, but no matter what the FLIP is set to the reverse side print will always be upside down. This seems to indicate that there is some communication problem between Affinity and the printer driver??? 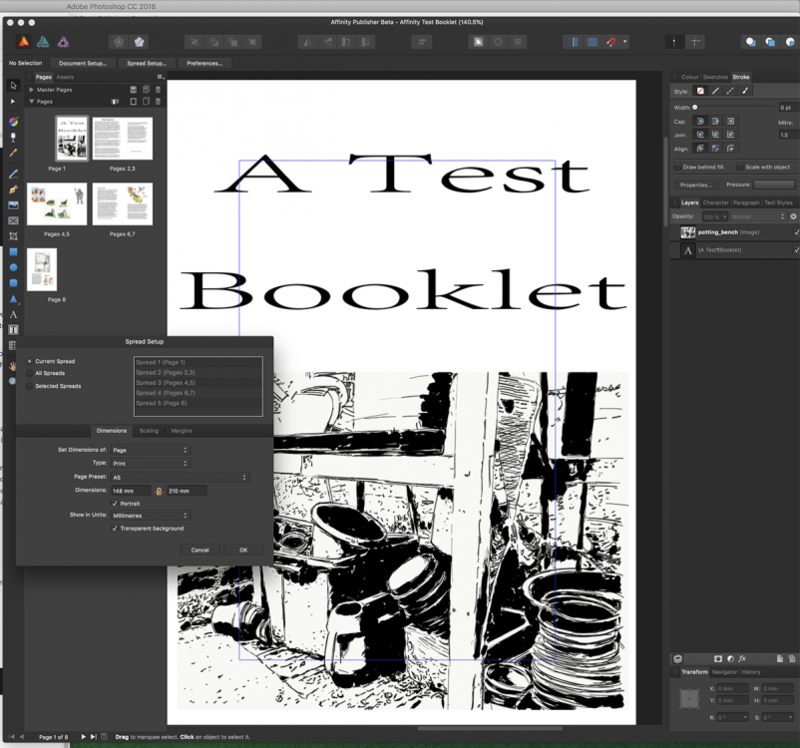 The images below show the only settings that produced a booklet. First image is Affinity and second is my printer. I have been using Microsoft Publisher until now and it seems to behave as expected, so there is some problem here to sort out. I tried to print it out like this. But I can't. A4 pages are printed as double-sided A4, and then stapled together in the middle (Toshiba eStudio 4555). BenVang, thank you for that workaround. Unfortunately my iMac can't access the HP printer driver, which I'm familiar with from printing on PagePlus from my old PC. I have PagePlus working in Windows 10 in Parallels on my iMac but again it's unable to access the Windows version of the HP driver. 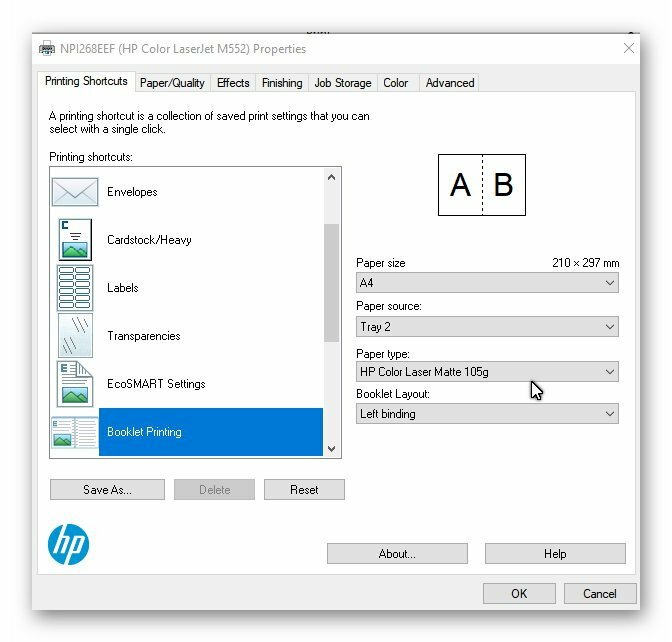 I can't select print to pdf form my print menu. How can I get this integrated? In a post above somebody has this option.